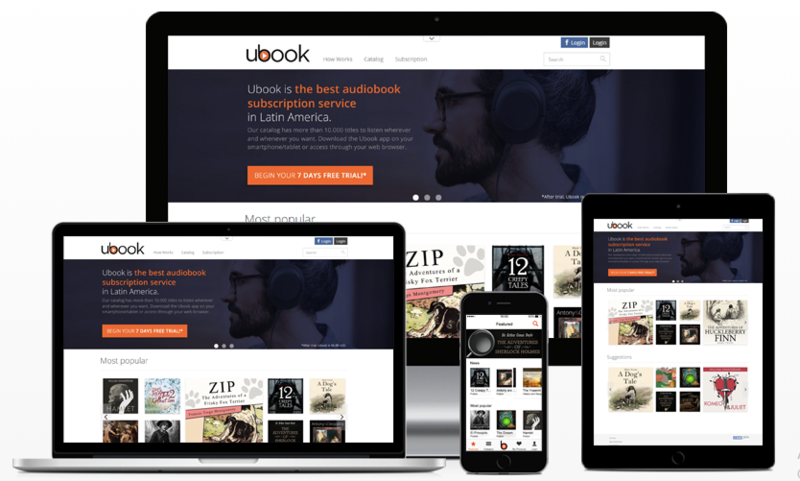 Brazilian audiobook firm Ubook is preparing for an IPO in Canada that will value the company at anywhere from USD $8 – $15 million as CEO Flavio Osso looks to expand Ubook’s operations further into Europe. Founded in Rio de Janeiro four years ago, Ubook is today by far the leading audiobook player in Latin America ­­– helped by the fact that Amazon’s Audible has yet to enter the Ibero-American audiobook market. That will happen, in time. Amazon has for over a year now been beavering away at its Audible Spain launch, and early indicators suggest it is intended as a Spanish-language markets venture, not to be limited to Spain. This week Audible took a step closer with the launch of its Audible Latino portal on the US site. The portal is aimed primarily at Spanish-speakers in the US, but as publishers tend not to get as restrictive with audiobook territorial rights as they do with ebooks (which adhere to the same limitations imposed on the print edition) the Audible titles may be available across Latin America and in Spain. But that’s not the same as a dedicated Audible Spain / Spanish markets launch. We know Amazon initially sought a Country Manager Spain via LinkedIn, and has since been negotiating with publishers to get Spanish-language content on board, with Audible Latino bearing the first fruits. Does this mean Ubook will face an uphill struggle to maintain its position as Latin America’s leading audiobook company? Ubook CEO Flavio Osso thinks not. In Latin America the imminent arrival of Audible is welcomed by Flavio Osso at Ubook, both in the Spanish-language countries and in Brazil itself, where Amazon already has a Kindle store and has been in talks with Brazilian publishers about audio. We have spoken with Amazon and encouraged them to launch Audible here; it is much better to have a 50% market share of a market that is valued at 3 to 4 billion USD than to have 100% share of a market that is valued at 50 million. has over 6 million registered users, 15 thousand titles present in its catalog and, until the end of March, a presence in 18 different countries including Spain, Germany and Mexico. Osso did not reveal Ubook’s annual revenue, he did however confirm that it is “well over the 8 digits mark”. The IPO news comes as Sweden’s Storytel prepares to launch in Brazil. While Amazon famously has a one title per month subscription model, Ubook operates on the same basis as Storytel is offering consumers all they can listen to for a monthly fee. Ubook has not yet responded to a query about the publisher remuneration model Ubook uses. Storytel famously started out with a fixed payment per title model but started this year with a pay-per-minute-consumed model. In the short term this is all good news for consumers. Competition helps keep audio publishers and distributors focused on providing best services. But as we are seeing with video subscription, and to an extent with ebook and audiobook subscription already, when some players decide to use exclusivity as a bargain chip, consumers end up with less choice or having to pay more to keep their consumption options open.